First of all a little sorry to all my subscribers and partners: first my camera broke, then my laptop! OOPSIE! 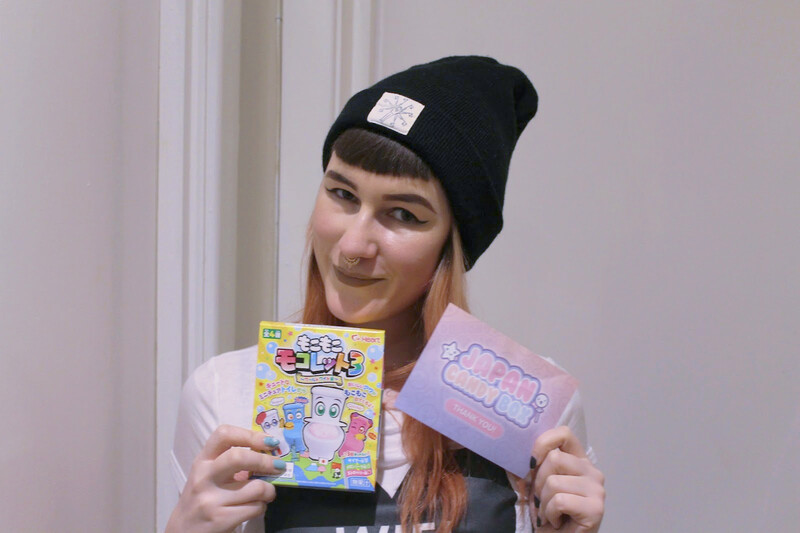 I bet you can imagine how excited I was when I received my super cool Japan Candy Box! The subscription box arrives monthly and contains all kinds of crazy sweets that make your eyes pop and your mouth water. It costs 18$ a month; so probably around 10£ and 15 Euro and you get up to 10 unusual japanese sweets. But let's be honest; I was a little bit scared of trying them seeing that I had no clue what the parcels say! As I do not want to bore you with too much text I recorded a rather funny video that should will be online soon! My personal highlight was the definitely the toilet candy! Yes, you heard right. The little box contained a plastic toilet, stickers and little sachets with sherbet. You have to fill the toilette with the sherbet and add water, then drink from it with a little straw. Why not mix it in a glas you wonder? Well, .... because this is not the way it works and drinking from a miniature toilet is obviously much cooler. The two most delicious sweets were definitely "Tohato" and the little chocolate waffle fish. Tohato are caramel flavoured crisps, which seem slightly unusual at first as crisps in europe are usually savoury. I definitely think that they should be a "thing" over here too! "Milky" definitely wins cutest packaging! How lovely is that kids face?! The sweet itself is a mix between caramel and hard candy with a milky touch! Very much like other sweets on the European market. Poppingcandy is something we all love since our childhood but the one in the sachet above is special! While the popping candy is much more intense than ours it also comes with little lemon drops that melt in your mouth! A definite yes! IF YOU WANT TO FIND OUT MORE ABOUT JAPAN CANDY BOX, STAY UPDATED ON MY BLOG! LATER THIS WEEK YOU CAN EXPECT A VIDEO SUCH AS A SUPER YUMMY GIVEAWAY!!! I need this in my life, just all looks so so good! Süß die würde ich gerne mal probieren!